Blitz! ran from 28-31 May 2014 at the Cripps Hall Theatre. Dress Rehearsal photos were taken by redrex Photography. 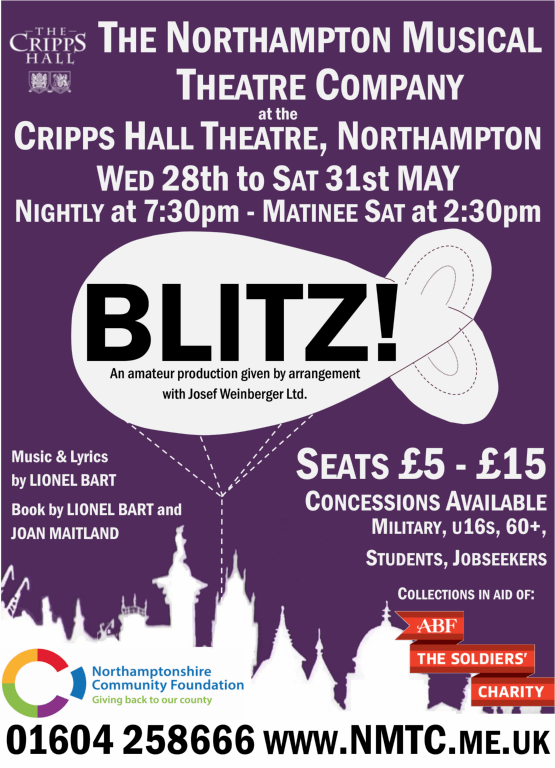 NMTC presented Lionel Bart’s “Blitz!” over 28th – 31st of May 2014 in the Cripps Hall Theatre, Northampton School for Boys. “Blitz!” is Bart’s follow up to the world-loved “Oliver!” and NMTC present it to commemorate 70 years since D-Day. “Set in Petticoat Lane, London, during the Second World War; two rival market stall holders, the Jewish Mrs Blitztein and Cockney Alfred Locke have a feud with enough power to rival the war! Meanwhile, Carol and Georgie (their children), have fallen in love – just wait until their parent’s find out! The families of the street take daily shelter in Bank Underground station from the German air raids and prepare to evacuate their young children to the country. Meanwhile, the young men of the street are enjoying embarkation leave, before they head out to the front line; assuming that they all report for duty! 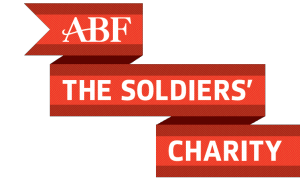 We supported ABF: The Soldiers’ Charity through collections during our run. They look after soldiers and their families for life. The charity was formed in 1946 when there was a need to look after the WW2 soldiers. Unfortunately, over the years, this need has not diminished; and indeed, it is now greater than ever. While soldiers are in the army, they are well looked after. However there comes a time, maybe 10 or 15 years later, when the past catches up with them and not only do they need our help but so do their families. The Soldiers Charity helps soldiers and their families with many of the ordinary things in life, the small things that make an immense difference to them. On arriving at the Cripps Hall I passed through the glass doors that had been taped in the style that was mandatory during World War II, inside all the windows were taped too, I was given a programme fashioned on a war time ration book; I think I knew then that it was going to be a very special evening! Director, Lisa Simpson, has certainly done an excellent job with Blitz!… not just with the Principal performers, but also with the very strong chorus line up, each one holding their characters throughout the performance. The team of thirteen children (Jives) were absolutely delightful, their number “Mums and Dads” was a joy to watch and I’m sure the other group of children (Jitterbugs) will be equally enchanting. Well done Lisa for what you achieved with the company. Musical Director, Graham Tear, has once again brought the score to life, along with his very talented twelve piece orchestra, doing great justice to Lionel Bart’s music. Charlotte Franks’ choreography was both original and energetic with some superb routines, the full company numbers were terrific to watch. Well done! All the principal actors were well cast in their roles and each one gave very good performances. Becky Woodham gave an outstanding portrayal of Mrs Blitztein, without a doubt this was the performance of the evening! Ian Stark as Georgie Locke was most endearing with strong vocals, especially the number “Far Away” that his character sang with Carol and the company, this was my moment of the evening – it was beautiful. Lillian Thorn, Carol Blitztein, gave a sweet performance, with lovely vocals, her solo “Far Away” was really moving. Lillian was very convincing when her character was blinded, not an easy thing to convey. Susie Lamb as Elsie, brought plenty of humour to her role, giving a performance that I enjoyed very much. There were strong performances too from Robert Laurie as Alfred Locke, Peter Thorn as Harry Blitztein, Keith Loynes as Ernie Nearmiss, Helen Loynes as Mrs Josephs and Joshua Mobbs as Siddy Blitztein. These were all ably supported by solid performances from actors in the smaller roles. Well done to you all. The set design was excellent, with the use of a balcony and steps leading up to it there was a great sense of depth to the stage; I loved the use of the projection screen throughout, which added much to the visual impact. The props were well made and used. Costumes were in keeping with the period and looked really good. The hairstyles were stunning, well done to Richard Blundell who must have worked so hard on them. The makeup, sound and lighting all added to this production. Overall this was an excellent opening night, the NMTC should all be proud of “Blitz!”. Thank you for a most enjoyable evening and good luck for the rest of the run. I came to Blitz! with zero knowledge of both the musical itself and the amateur group Northampton Musical Theatre Company performing it. It is safe to say that I left after almost three hours pleasantly surprised by both. My live musical theatre viewing had amounted to just two previous, both in the last couple of months and I had been surprised how much I had enjoyed them, despite trepidation at the outset. Likewise, my only previous example of an amateur theatre group had been of the Masque Theatre and they had been very good and set a high bar for NMTC to jump over.I have to say, they cleared the bar with sufficient ease, with a quite stunning, polished and enjoyable show. The production was quite simply excellent with hardly a duff note to be heard. I think I would be fair to say that there also wasn’t a duff performance amongst them. A few stuck out as being simply excellent, like Susie Lamb as the loud and brazen Elsie, complete with eye popping swift dress off performance. Keith Loynes was also wonderful as the comical Ernie. Also impressive as the lovers Georgie Locke and Carol Blitztein were Ian Stark and Lillian Thorn. However, although I keep doing it (and I suppose I must), I do hate singling out performers as this was a cast performance of great quality and for an amateur one, a wonderful commitment from all involved to get it to this standard. The unfamiliar songs were tremendously well performed. Leave It To The Ladies a delight on the ear and eyes. Mums And Dads wonderful by the highly talented young stars (they received the biggest reaction of the night from the audience). My pick of the songs though has to be Be What You Wanna Be, a great tune, and most entertainingly and professionally staged with the pause and move action of the main cast, and excellently sung by Becky Woodham (Mrs Blitztein). This one song summed the whole up for me, an absolute delight. Music was superbly performed from their orchestra pit and the staging was also solid and professional on the obvious lack of budgeting that must come with an amateur production. Likewise, the front of house organisation was of the highest quality, with drinks, raffle and display in abundance. All in all the whole evening was of the utmost quality from arrival to departure and without doubt, I shall be at the Royal & Derngate in October/November when their production of South Pacific hits the stage. Just wonderful and well done to ALL involved.